A Standards-based Discovery of the Social Heritage, Science, and Technology of an Agricultural System. A free, online curriculum for 21st Century learning, professionally standardized for grades 3-5. It's an interactive, self-paced program, including separate teacher and student sections. Let your student explore the historical development of the cranberry industry in Massachusetts, while learning modern day farming practices. Learn what cranberry growers are doing to be good stewards of the land through innovative and sustainable technologies. Be sure to visit Exploring Cranberries! Adopt a Bog is the second section of the Exploring Cranberries program. Unlike the other two sections which contain individual lessons, Adopt a Bog is one comprehensive, integrated lesson that unfolds over the course of two to three, 45-minute class sessions. Students’ objective is to choose one bog among three to adopt. Their choice should be guided by their understanding of what makes a successful cranberry bog. 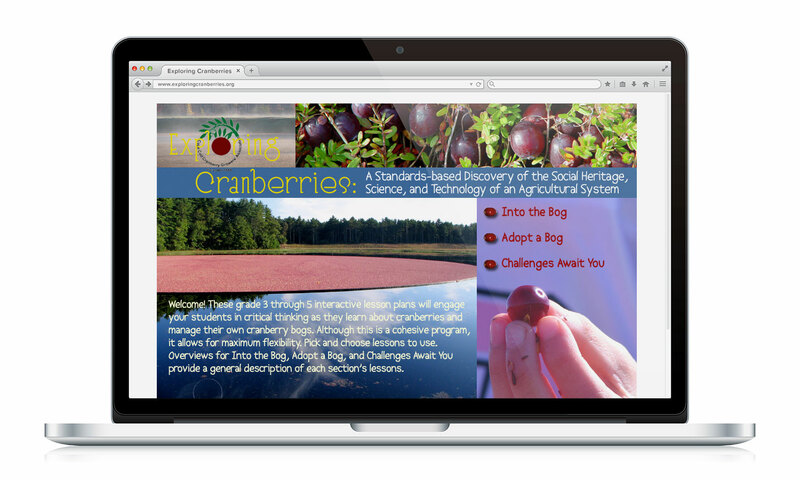 To help them make this decision, students are coached by virtual cranberry growers as they investigate critical features of a thriving cranberry bog. After their careful research on the three prospective bogs, student pairs eventually select one to adopt, and receive feedback on their decisions. Now that students have become familiar with the cranberry, its habitat, its history, and its people, they’re ready to face and tackle various challenges cranberries growers typically deal with in Challenges Await You. This section of Exploring Cranberries offers three distinct scenarios involving frost management, pollination and Integrated Pest Management (pest control).